This is a version of the Five Year Butterfly Sweater, commissioned by a lovely lady from Australia. In this version, the background is variegated green and the swirls and butterfly are simply red. A foldover pattern of alternating variegated red and light green marks the neck, arm openings, and hem. 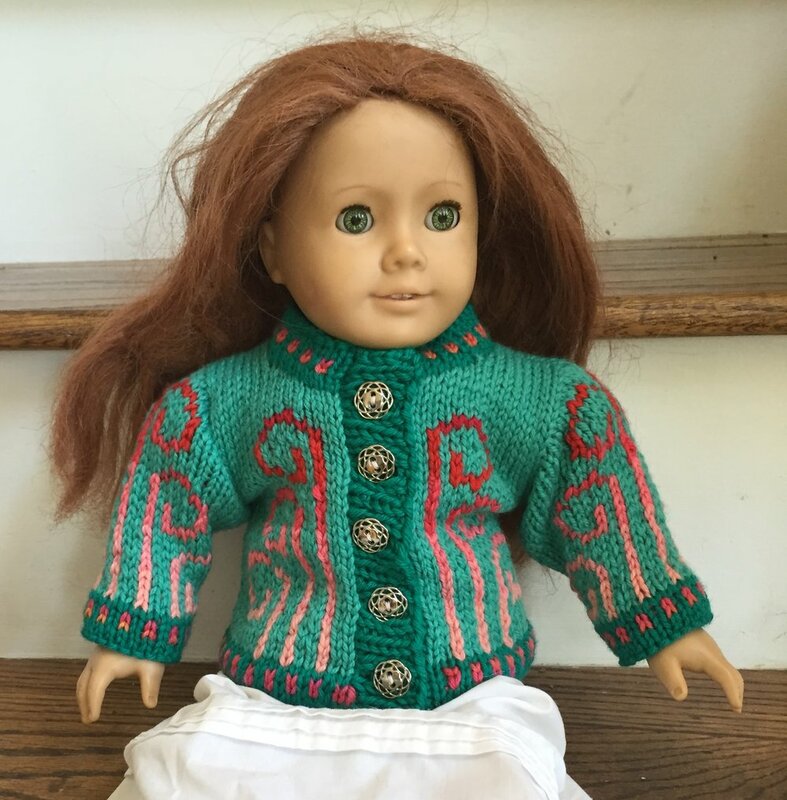 When Amaran and Jirina were little, they loved playing with their American Girl dolls, so I started knitting sweaters for the dolls. These are updated versions of the old sweaters. The first is in red with varying blue swirls. The placket has pewter buttons. The neck, wrists and hem are ribbing in darker red. The second is green with pink to red varying swirls. (The pictures show the same sweater; for some reason the colors don't read the same.) The neck, wrists, and hem is a fold-over pattern of simple variegated red lines on darker green. The placket also has pewter buttons. It is hard to do color work on doll sweaters, because their fingers can get caught on the yarn as they are being dressed. Children can be told to make a fist to minimize that. It is important to knit the color strands tightly so fingers don't get caught and yarns aren't pulled. This is a variation of the Roses pattern, in lovely light and medium pink. This is sized for a six month old, but obviously this is impractical for getting on and off. The neck and wrists have a simple picot trim and the hem is a lace pattern, all in the darker pink. I did at least make sure the neck was stretchy for a little one's head, but this needs to be redone with easier openings. 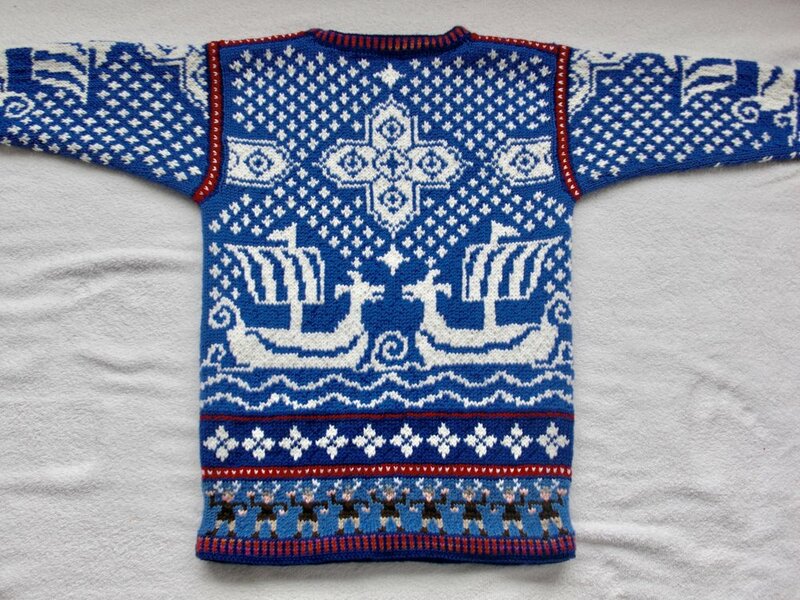 This is a commissioned larger version of the Five Year Viking Ship sweater. There are only a few changes that were necessary to maintain almost the same design. I added a trim pattern above the Vikings, of simple white diamond flowers on a dark blue background. There are a few extra stitches at the sides and top. This shows how easy it is to add length and width if there are trim pattern elements in a sweater. This sweater takes its inspiration from Alice Starmore. 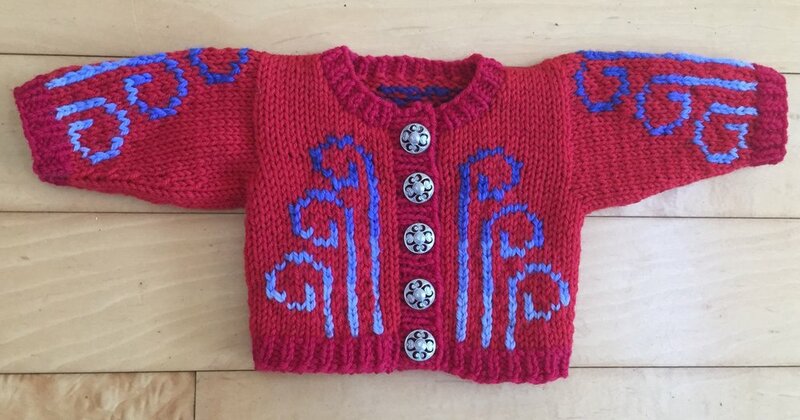 This is a the original version of the Nine Years Flowers sweater. Here again is the periwinkle and variegated red theme. The neck trim and the band across the chest are darker blue and shades of pink. The wrists repeat the chest band pattern. The peplum at the hem is dark blue and rows of pale pink to dark pink.